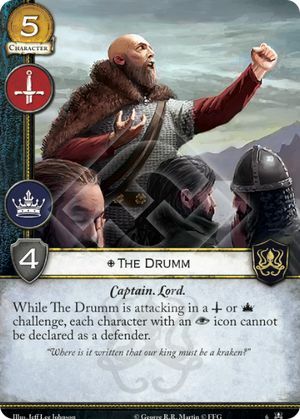 A character with an intrigue icon can enter the challenge through card abilities such as My Mind is My Weapon or Wardens of the North. 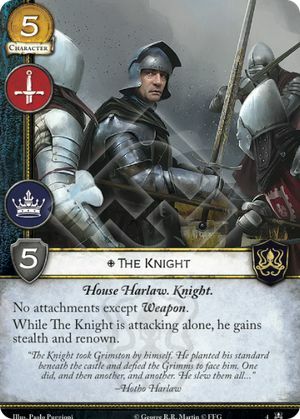 If you win a challenge with The Knight and other characters, he can still gain renown if he is alone in the challenge when it’s time to trigger keywords. He can also trigger abilities based on when a Knight character wins a challenge alone as long as he is alone before or during the reaction window for winning the challenge. (Ex: You win a challenge with The Knight and The Hound). If you do not find a Lord or Lady in the top 10 cards, the pre-then aspect of the effect did not resolve successfully and thus you cannot sacrifice a Lord or Lady. You can choose not to find a Lord or Lady despite there being a Lord or Lady in the top 10 cards. If you find and put into play a duplicate of a Lord or Lady, the pre-then aspect of the effect did not resolve successfully and thus you cannot sacrifice a Lord or Lady. 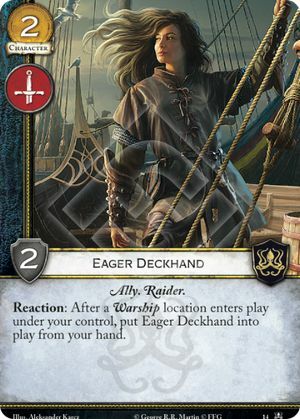 If a duplicate of a unique Warship enters play, the triggering condition has not been met and you cannot put Eager Deckhand into play from your hand. 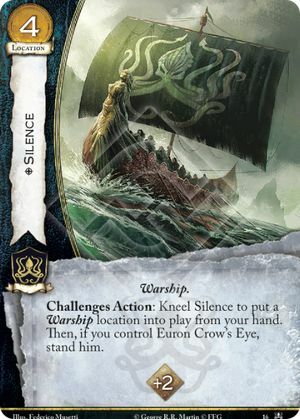 If you put a duplicate of a unique Warship into play, the pre-then aspect of the effect did not resolve successfully and thus you cannot stand Euron.